That’s nearly 700,000 people on contracts where the work is not guaranteed and they have an insecure income and, of course, zero employment rights (they are “zero” in terms of more than just hours). Effectively, these people are not employed as we know it. They are neither full-time nor part-time. They have work purely when the employer deigns to instruct them to work – often at very short notice (I know, I’ve worked in retail in a management role and know exactly how it works). So, it seems reasonable to me to package up the zero hour contracts with the figures for unemployment, because they aren’t employed in any real sense. The latest employment figures suggest that 1.91m people are unemployed. If we tack on the zero hours contracts, we get a grand total of 2.6m unemployed (ok, let’s call it underemployed, or 2.6m people not fully employed). But if we have to do this for the Coalition period, we also have to do this for the period immediately before they came to office. You know, to be fair and all that (we all know Cameron likes to bore on about fairness). In May 2010, when the Coalition was formed, unemployment stood at 2.48m. According to the (revised) figures from the ONS, there were approximately 190,000 zero hour contracts [PDF] in 2009 (last full year of the Labour government) and 168,000 in 2010 (the first year of the Coalition). If we split the difference and say that there were 179,000 zero hour contracts, and add it to the unemployment figure for May 2010, we get…a grand total of 2.6m unemployed/underemployed/not fully employed. So the figure is unchanged. Despite the rhetoric from the Coalition (and particularly the Tories), the employment situation has remain largely unchanged in the sense that there are still 2.6m people in this country who are not full employed in the sense that they have stable hours, a stable income and proper employment rights. The only significant difference is that increasing numbers of people are being forced off the social security that they have been paying into, and into insecure employment. Well, that seems fair doesn’t it? Q. Why does Francis Maude hate the elderly? There is nothing wrong with moving government services online. Undoubtedly it has made a whole range of services much easier to use and access for the majority of citizens. I can now go online and purchase my car tax disc in a matter of seconds rather than having to dig out a load of paperwork, complete a paper form and stand in a long queue at the Post Office. I can access information about a range of government services relatively quickly and painlessly (well, considering it’s gov.uk), and I wouldn’t swap that for doing things the ‘old’ way for anything. However, this is where Francis Maude and I depart in terms of understanding the digital world (obviously in broader political terms we depart much earlier than that). Because I understand that it’s a majority not because the minority can’t be bothered to get online, but because for many it is simply not possible to take advantage of digital services. It’s for this reason that Francis Maude appears to have launched a rather bizarre crusade to get the elderly online. Rather than persist with a mixed approach to government services (ie digital and ‘analogue’ in tandem), Maude is determined to move towards an online policy and if the elderly or the poor are unwilling to get on the internet, then they will lose access to key government services. It is unclear how exactly his government will then provide these people with the support they need, he appears to believe that they can be sidelined and ignored without having an impact on society in general. There are any number of things wrong with Maude’s rather blinkered approach to digital services. The most obvious is, of course, that to get online costs money. Not only does it cost money to buy the initial start-up equipment (computer and other equipment), but it also costs money every month to have a connection to the internet. When one considers that Office for National Statistics (ONS) figures demonstrate that 13% without an internet connection point to equipment costs as the reason and 12% say access costs are too high (all age groups), it’s clear to see that the reason why they are not online is not down to a proportion of citizens being, as Maude terms it, computer “refuseniks”. They are not refusing, they are unable to choose to get online. Quite a substantial difference, and one that is often overlooked by the comfortable middle classes who assume that, because they have a computer and an internet connection, everyone must be online (it’s this same middle-class assumption that leads to the old “we don’t need libraries anymore because everything is online” nonsense). 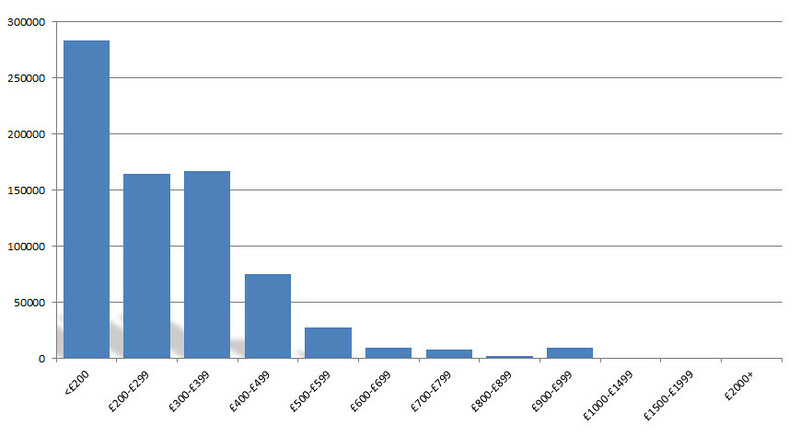 And it’s not just the cost of getting online that prevents pensioners from getting online. The ONS figures also reveal that 20% claim that a “lack of skills” is the reason why they are not online. Again, these people are not “refuseniks” they are people who simply do not have the skills to get online and make use of the many services the rest of us take for granted. If we are going to effectively force these people to get online, where is the support going to come from (aside from the paltry ‘one-off’ ‘assisted digital option’ proposed by Maude)? Public libraries seem to provide the most obvious mechanism for addressing this lack of skills but, well, they are being closed, hollowed out and stripped of their ability to provide the kind of support that would benefit those that are digitally excluded. All of this rather begs the question: what will the government do about those that are excluded? It’s all very well talking ‘tough’ as Maude occasionally likes to do, but what does this mean in real terms? For those who cannot afford to purchase the equipment or to obtain the skills necessary to get online and utilise public services, what are their options? Will they just be left, excluded from important government services with the subsequent knock on effects and additional costs to the taxpayer (to adopt standard Tory terminology for a second…I promise it won’t happen again)? Or will the government purchase the equipment and the connection for those without in perpetuity (highly unlikely given the ongoing costs)? Nowhere in Maude’s grand scheme does he explain how the government will ensure that those who cannot afford the equipment will not be left behind. Perhaps he doesn’t care. But there’s another element to this that is deeply troubling. The switch to digital also puts the emphasis on the citizen paying to access government services – government services that they have paid for through taxation. Whereas accessing government services would have come at no cost to the citizen but would be met by the government agency (eg leaflets, consultation time etc etc), the cost is now borne by the citizen. Twice. Once through taxation and once in accessing the government service online (which although does not require payment in and of itself, requires the citizen to make a payment to a corporate entity in order to access those same services). Now, that might be fine for people like myself and Maude, but I would argue that the most vulnerable and the poorest in our society should not have to expect to pay twice to access government services. They should be free and accessible to all in whatever format suits their needs. This may cost the government a bit extra, but better that than costing the citizen extra. Government services must be free to access, not effectively placed behind either state or corporate paywalls. For some time now Maude has been pontificating about the need to drive government services online. Of course it is of great benefit for the majority of us that these services are available online and facilitate quick and easy access to government services. However, there remains a minority who, should the move towards a digital only policy take effect, will be marginalised and excluded from our society. The needs of the people must take precedence over the need to save money, the consequences of getting these priorities in reverse order will be felt for decades to come. 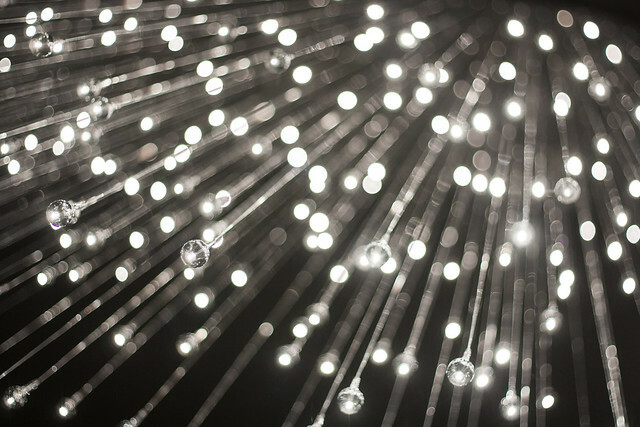 The government would do well to remember that, not just in terms of the move towards digital only but also in terms of their broader economic and social policies. But I won’t hold my breath. 7m people have never used the internet, so why is Universal Credit ‘digital by default’? Unusually, the recent figures from the Office for National Statistics (ONS) regarding internet access made a lot of headlines upon their release (and a lot of tweets, far more than I usually notice when the quarterly figures are released, particularly from journalists). I say unusual as these figures are part of the ONS’s quarterly update figures and I am fairly sure they haven’t received this much coverage in the past. But these figures are important, particularly in the context of the government’s changes to the social security system and the drive to make all claimants do so via the internet. As I have repeatedly warned before now, this drive is likely to leave many isolated and, as the Joseph Rowntree Foundation argue, trap many in poverty. So what do the figures actually tell us about the digitally excluded? 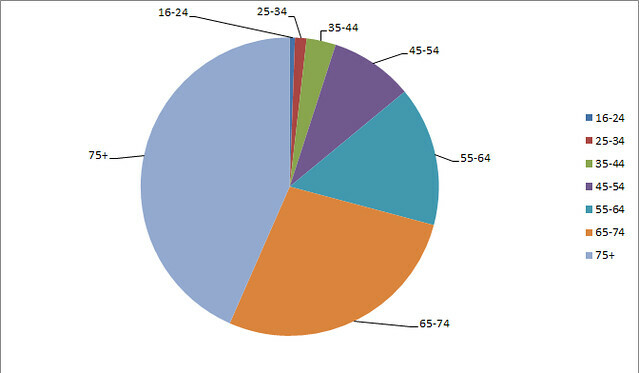 Now it is clear from the chart that those of non-working age (ie 65+ and, of course, some people in this group may well still be in employment) far outweigh those of working age in terms of never having accessed the internet, but the working age segment is still quite significant (to be clear on this, “working age” will also include those who cannot work – but they will still be required to access Universal Credit, so the substantive point still stands). 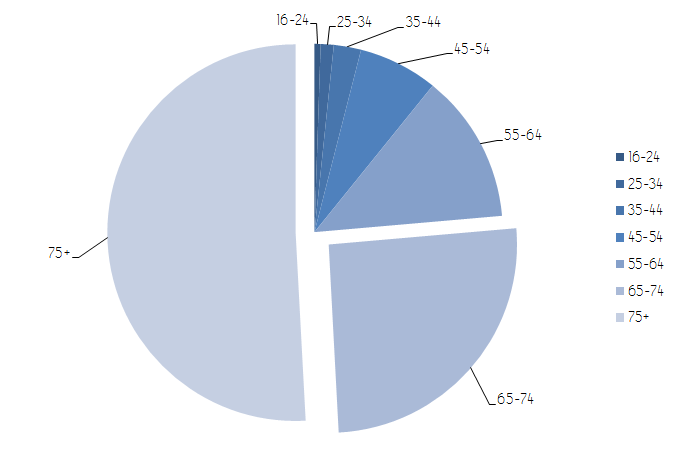 Over a quarter of those who have never accessed the internet are of working age. 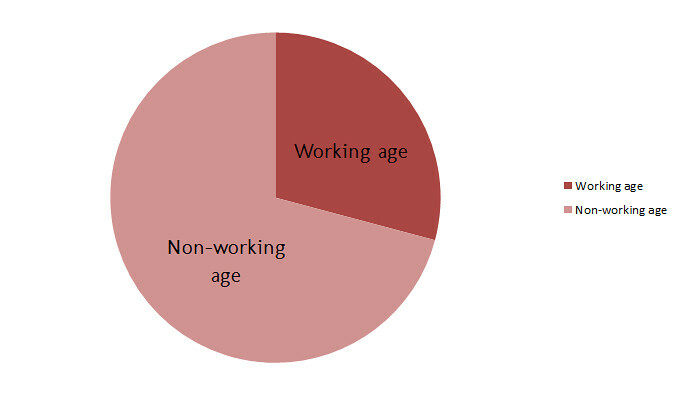 In fact, when you look at the hard figures, over 2 million people of working age have never used the internet. Whilst significantly lower than the overall figure (7 million) this is still quite a sizeable chunk of the population, and perhaps a little surprising too. I focus on this aspect particularly as quite often those who aren’t online are widely assumed to be the elderly, but it cuts across all age groups. It is also worrying as this group of people are those most likely to be affected by the move to digital by default for benefits claims and seeking work should they be (or become) unemployed. To be clear, 2 million people have never used the internet and are likely to be affected by the government’s “digital by default” policy when it comes to social security. It is also worth reiterating that all of these figures refer to the numbers of people who have never used the internet, not those who do not have the internet at home. 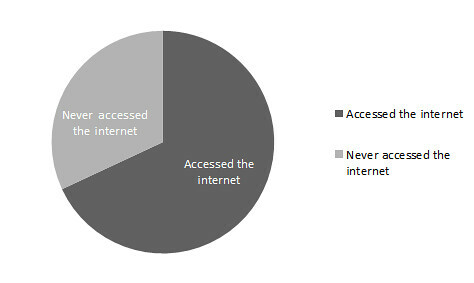 The chances are that the figures for those without internet access at home are slightly higher than the figures for those who have never used the internet. I think it is important to keep that in mind when looking at these particular statistics. Furthermore, it is also worth keeping in mind that a recent survey suggested that 16m people lack basic online skills. So even if there are a majority who have accessed the internet, this does not mean to say that they have been able to do so without support or without difficulty. The divide itself is drawn along two distinct lines: access and skills. Whilst the divide between those without skills cuts across social boundaries (impacting open rich/poor, young/old etc), the access divide appears to be starkly drawn along income lines. 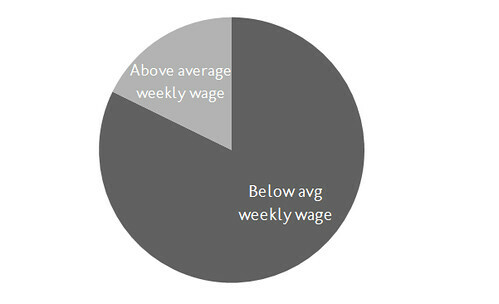 The vast, vast majority of those who have never accessed the internet and are of working age, therefore, are clearly among the poorest in society (approximately 600,000 fall in the under £400 bracket – which therefore does not include those earning £400-443 who are also below the average wage). Now all of this is pretty much as one would expect, but I think it is worth laying this all out so we can see clearly to what extent a divide exists between those who have accessed the internet and those who have not. Indeed, when you look at the hard figures, approximately 5% (616,000/12,515,000) of all of those earning below the average wage have never accessed the internet compared to 1% (133,000/11,878,000) of all of those earning above the average wage. You are, therefore, nearly five times more likely to have accessed the internet if you earn above average wage, than if you earned below. According to the figures, around 3.7m of those defined as DDA disabled have never accessed the internet (DDA disabled refers to those who self-assess that they have a disability in line with the Disability Discrimination Act (DDA) definition of disability). Again, this is a not insignificant number of people who will be adversely affected by any “digital by default” policy. What is clear beyond any doubt from these figures is that the poorest in society will clearly suffer as a result of the move to make Universal Credit and Universal Jobmatch “digital by default”, the very group of people the social security reforms are supposed to benefit. With two million people of working age never having accessed the internet before, the consequences of sudden unemployment are stark. They will need a great deal of support both in terms of claiming benefits and in terms of seeking work, and the current mechanisms in place are not fit for that purpose. There is a very real and very clear divide here in terms of access to the internet, and the move to digital by default will clearly entrench one aspect of the divide between the haves and the have-nots. As the Joseph Rowntree Foundation concluded, Universal Credit could very well trap people in poverty. For those two million people of working age who have never used the internet, unemployment could have disastrous consequences. With a lack of skills and access to the internet, they could find themselves trapped in poverty and find it very difficult to climb back out. “Digital by default” for those claiming social security or seeking employment is simply not a sensible policy. It is time for Iain Duncan Smith to acknowledge the trap he has created and to reverse a policy that is going to increase poverty rather than reduce it.